We always seem to be dreaming of a white Christmas, the ones that somewhere, at some time, someone used to know. And when the weather does respond to Christmas wishes, it usually comes a day or two too late and causes huge amounts of chaos on the roads, just as families are travelling across the country. 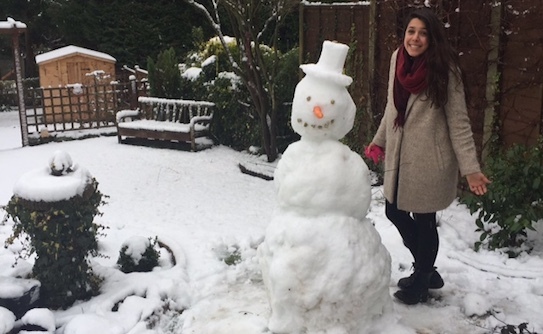 If you were lucky enough to not be travelling last week, and got a fair smattering of snow, it’s very likely that the kids were out in it, building snowmen and tossing snowballs. If not, there’s every chance that over the next few weeks we may get a load more snow. But why does snow fall, how does it settle and are snowflakes really completely unique from one another? There’s a lot of science that can be explored when discussing snowfall. So we thought it was good to strike while the topic was hot (or cold, very cold) and discover a little more about the chilly weather. 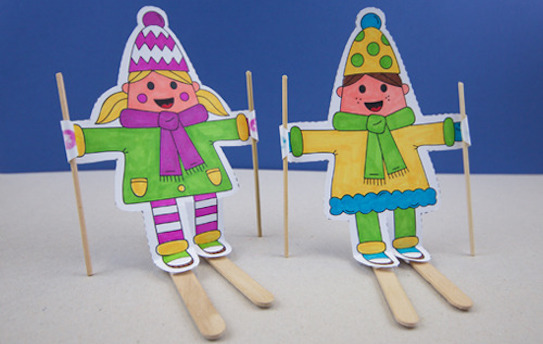 We’ve come up with some great facts to discuss with the kids, and a cool (sorry) craft to make your own set of cardboard ski characters. This is Renata, our Supply Chain Project Leader. Over the holidays she built her first ever snowman. Look how proud she is. To understand snowfall, we have to know a little bit about why it rains. When water becomes warm, it evaporates as water vapour into the air, forming clouds. When it cools again above our heads the vapour turns back to water and rain falls back down to the ground. When it’s really cold, the water vapour freezes into crystals, causing snow. If it’s cold and dry on the ground, the snow won’t melt. Instead, each flake of snow will land on top of the other, causing the snow to build… and play with! For it to snow, the temperature in the sky has to be freezing. So that’s 0°C, or 32°F. For it to lay, the ground also has to be 0°C or below. You might have noticed that when people go skiing they wear sunglasses or goggles. This is because if the sun is out, its light will reflect on the white of the snow and can cause harm to eyes. So if it’s sunny and snowy, wear some protective eyewear! Snowflakes are made up of tiny frozen crystals. Usually a snowflake is formed of about 200 of these ice crystals. Snowflakes have six sides. There’s a famous saying that goes, ‘no two snowflakes are the same’. As snowflakes fall to the ground, they will each take their own unique journey, and that journey will determine what they look like. For example, they will look different depending how quickly they fall or whether they get caught in a blustery wind. So when each one lands it will look different. But are they each completely unique to the human eye? Probably not. Who built the first snowman? We’re not too sure exactly who built the first snowman, but it’s been a fun snowy activity for hundreds and hundreds of years. Bob Eckstein wrote a book called ‘The History of the Snowman’ and explored the history of snowman building. The earliest documentation he found was of an illustration of a snowman from a book written in 1380. The biggest snow-person ever created was just over 122 feet tall, in America. They called the snow-woman Olympia Snowe. So what on earth do you do when the whole town is covered in snow? You have some fun! From snowmen making, health-and-safety-defying sledge rides down a hill to snowball fights, there’s a lot of fun to be had when the white stuff lays. But nothing quite beats skiing. 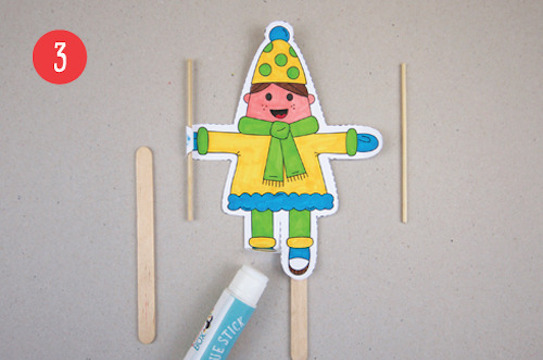 So we came up with a quick activity to do at home, with some cosy-looking toucanoo templates, lolly sticks and skewers. 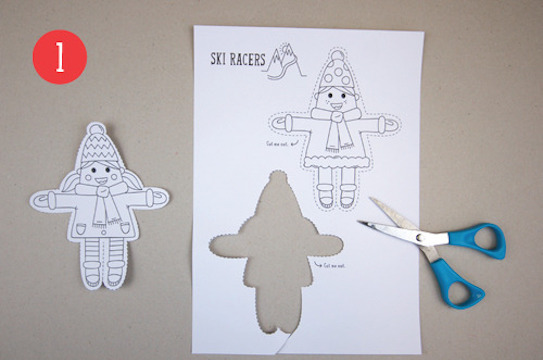 Make your very own ski team! 1 Print out the template onto card. If you don’t have any white card you could print on paper and stick it to the back of a cereal box. Cut out the characters. 2 Colour in the templates. 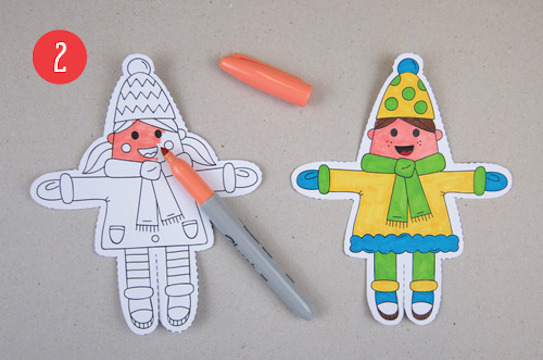 3 Make a small fold above each character’s snow boots. 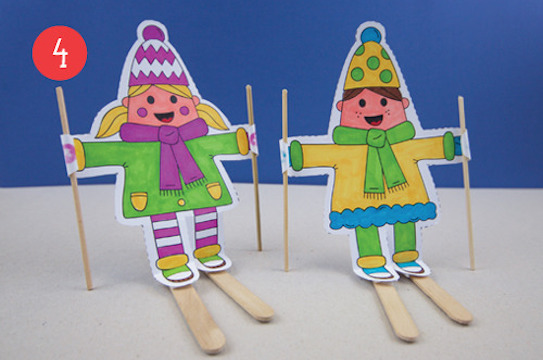 Glue a lolly stick to the bottom of each boot to make skis. Stick a skewer to each mitten. 4 Head for the slopes!